2. Once in, click on the Construction Tools tab. 3. Click on the EZ-PageBuilder. The first time you enter a new page, the "Add New Block" window automatically appears. The default block is the Title block. This is the block we want to use. 1. Title is already selected, so then click Next Step. 2. Type some text into the text box. 1. Click on the Font|Color|Size button. 2. 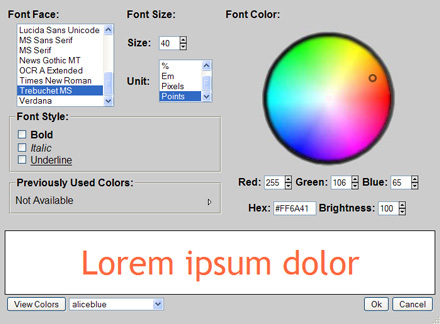 Change the text color by clicking a point on the color wheel. Adjust the brightness, click the up and down arrows next to the Brightness. 3. Change the Font size. 6. Click the Submit to add your new title to the page. In the top left corner of the new Title block, you will find a small red number 1. This number identifies the position of this block on the page. You will also see a menu bar with several icons. This menu bar can be used to add, edit, delete, move, and copy blocks on the page. When you mouse hovers over one of the icons a description of the icon will be displayed. 2. Click the Type dropdown, and select Horizontal Line. 5. Choose a Line you like. For a nice simple line choose "Line 41"
The horizontal line is now just below the headline Title block and is labeled block "2." 3. Write some text about your company and push submit. 2. Select Graphic from the dropdown, and click next step. 4. Choose an image and hit Open. You now have a simple webpage with a Title, body text, and an image.